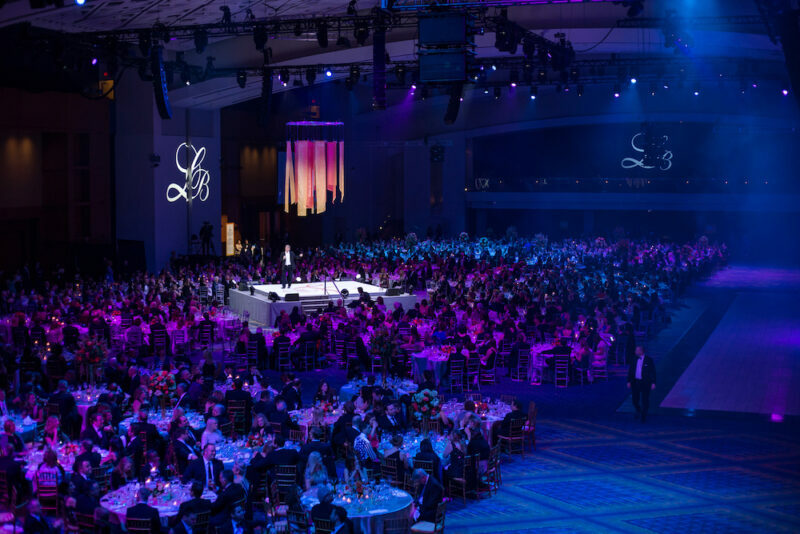 This year marked the Leukemia & Lymphoma Society National Capital Area Chapter’s 32nd annual Leukemia Ball, a black-tie affair that brought together 1,800 guests and raised $3.2 million for LLS’ efforts helping to create a world without blood cancers. The March 14 ball took place at the Marriott Marquis Hotel in D.C. — a change from previous years when the event was held at the Walter E. Washington Convention Center. The 2019 Leukemia Ball co-chairs Richard Bynum, president of PNC Financial Services Group in the Greater Washington Area, and Tom McCarthy, partner at Akin Gump Strauss Hauer & Feld LLP, led the ball’s executive committee of more than 40 dedicated business leaders in the D.C area. Bynum and McCarthy were chosen as this year’s chairs because of their passion for the LLS mission and their continuous philanthropic involvement in their own communities, said Beth Gorman, executive director of the LLS National Capital Area Chapter. Journalist Craig Melvin, host of NBC’s “Today Show,” and Fox Sports correspondent Lindsay Czarniak, who has a family connection to blood cancer, hosted the program while guests enjoyed entertainment from comedian Kathleen Madigan, rock band O.A.R., a silent auction, speaking engagements, dinner and dancing. Guests also joined in the “Fund the Fight” segment, an effort to help fight blood cancer through donations made to LLS. This year’s contributions totaled more than $330,00, Gorman said. Geoff Grubbs, an LLS volunteer and chronic lymphocytic leukemia survivor, shared his personal story during the “Fund the Fight” segment about how LLS-funded research benefited him and other blood cancer survivors. The event concluded with the drawing of the winner of a new car provided by LLS partners at Mercedes-Benz and recognized the recipient of the 2019 James L. Eichberg Lifetime Achievement Award, Joe Kelley, vice president of global government and international corporate affairs at Eli Lilly and Co.
For the past 15 years, Kelley has volunteered and partnered with LLS and, additionally, has helped raise roughly $10 million to support new and advanced life-saving therapies in honor of the memory of his first wife, Shelley, who lost her life to blood cancer. Funds raised from the event will directly support LLS’ mission, Gorman explained. Among the research projects that will receive funding from this year’s ball are the LLS Children’s Initiative, which helps children “survive blood cancer and thrive in their lives after treatment,” and the Beat AML Master Clinical Trial — a national research trial involving more than 400 patients in an effort to help cure acute myeloid leukemia, Gorman said. For more information about next year’s Leukemia Ball and how to get involved, click here.